Since the invention of the transistor and later on the integrated circuit, microelectronics has proven to be crucial as driver for innovation and welfare in our society. Many applications would not exist without integrated electronics. The computer, the digital media revolution (e.g. CD, DVD, mp3), the wireless communications, the internet, etc. would not exist without the relentless scaling progress and resulting performance improvement and cost reduction realized by microelectronics. In the near future this progress will continue even further with electronics contributing to reducing our energy consumption, enabling ubiquitous wireless monitoring and data streaming, invading daily objects networked in the internet of things, and even entering the human body. In most of these applications the electronic systems interface with our physical world. Although the strength of electronics lies in the power of the digital compute engines that perform the signal and data processing, analog and mixed-signal circuits (or at higher frequencies RF circuits) are needed in the interfacing with the real-world signals. The current sub-100nm CMOS technologies even enable the integration of entire systems, including both the digital core and the analog interfaces, onto a single die (System on Chip) or into a single package (System in Package), offering even further cost and performance advantages. The inescapable use of analog circuits however poses some serious challenges. First of all, since the information is represented by continuous-valued signals, analog circuits are intrinsically vulnerable to all kinds of “interferences”, be it noise, process variability, crosstalk, etc. Secondly, the functionality and performance of analog circuits are a result of the complex interplay of many devices, the way how they are interconnected and their sizing and biasing. This makes the understanding of analog circuits and how they work quite complicated, and requires years from students and designers to develop the necessary insight and expertise. To assist them in this process, they mainly utilize the numerical circuit simulator SPICE (or any of its commercial implementations), which is indeed a great tool for design validation. and to make symbolic analysis tractable for circuits of practical size. This edited book provides an overview of the current state of the art in symbolic analysis. The editors have compiled chapters from the key contributors to the field of symbolic analysis. These chapters neatly describe the latest results in terms of algorithms as well as applications of symbolic analysis techniques for analog circuits. Recent algorithmic improvements highlight the potential of today’s symbolic analysis methods, both in terms of circuit complexity and of circuit characteristics that can be analyzed. The second part of the book presents the wide span of applications that utilize symbolic analysis, ranging from behavioral and performance modeling over design centering and fault diagnosis to automated design and system architectural exploration. These chapters clearly demonstrate the potential of symbolic analysis for analog circuits, in complement to or in combination with numerical simulation techniques. This combination of state of the art information about algorithms and applications makes this book highly recommended reading for everyone interested in using symbolic analysis towards electronic circuit design, be it to improve his/her insight in circuits or for any of the other applications. The many circuit examples used throughout the whole book nicely illustrate the capabilities, and both circuit designers and CAD professionals will benefit from this information. Please enjoy reading this book. Symbolic analyzers have the potential to offer knowledge to sophomores as well as practitioners of analog circuit design. Actually, they are an essential complement to numerical simulators, since they provide insight into circuit behavior that numerical analyzers do not. Symbolic analysis of electronic circuits addresses the generation of symbolic expressions for the parameters that describe the performance of linear and nonlinear circuits in the three domains: DC, AC and time; some or all the circuit parameters can be kept as symbols. In particular, in AC analysis these expressions are generated as ratios of polynomials in the Laplace variable s, with, as coefficients, the sum of products of small signal elements of the design vector. Symbolic expressions for characteristics, such as voltage and current gain, input and output impedance etc. can be easily obtained. Furthermore, it is easy to acquire network characteristics such as sensitivity and noise. Due to the fact that these expressions remain valid during the change of component values (as long as models remain valid), designers can not only have an insight into the behavior of the network but also they can use the expressions to optimize the circuit’s performances. This book presents details and exemplifies such famous techniques. This makes the book a good resource for circuit analysis. Thus, it is intended to students and researchers as well as for industry designers. For large (and medium) size circuits, computed analytical expressions become too large and their number of terms is so important that its manipulation and interpretation become impossible. The book puts also the stress on this problem and highlights some techniques adapted to approximate symbolic description of circuit characteristics. Moreover, industrial current R&D topics, recent developments and future trends in the field of symbolic analysis are highlighted. Chapter 1, an overview chapter, presents a survey of the state-of the art of symbolic analysis techniques for the design and the verification of analog integrated circuits. It highlights major developments in this field over the past several years and presents the outstanding problems for future research. Chapter 2 gives a description of the Modified Nodal Analysis method. Analysis procedures of circuits containing classical and modern circuit elements are described. These methods are explained clearly in a number of examples with a view to the matrix form which is appropriate for computer implementation. Chapter 3 describes the modeling of nullor-based active devices from the circuit level of abstraction: active devices (voltage-mode, current-mode and mixed-mode operations). Several examples using nullor-based models illustrate its use to calculate fully-symbolic small-signal characteristics of linear analog circuits as well as on the analysis of nonlinear circuits. Chapter 4 presents two approaches based on the state equations and on the semi-state equations, respectively-for the generation of the transfer functions of MIMO systems in symbolic/numeric-symbolic matrix form. The state variable approach is developed in two variants: one uses the circuit matrices A,B,C,D, and the other one directly uses the state equations in the frequency domain. The method based on semi-state equations is developed both in two matrix representation and in a single matrix representation. Illustrative examples are given. Chapter 5 details and exemplifies the flow-graph approach. It presents used approaches for the determination of the modified Coates flow-graphs. Symbolic sensitivity using this technique is briefly introduced. Chapter 6 introduces the two-graph method. It details the construction of the corresponding networks, and presents such analysis both the frequency and time domains. The chapter also focuses on partitioning techniques and on active RC-circuit synthesis using the two-graph method. Chapter 7 details approximation techniques in symbolic circuit analysis. It reviews from the first approximation techniques, only intended to improve the interpretability of symbolic results, to the most modern approximate symbolic analysis techniques based on the approximation of the network equations and the direct generation of the approximated symbolic results. Chapter 8 deals with the symbolic analysis by the determinant decision diagrams. It shows how DDD-based symbolic analysis enables the exact symbolic analysis of many analog circuits substantially larger than the previous methods and open new applications for symbolic analysis. This chapter also covers approximation methods based on DDD-based symbolic analysis. Chapter 9 deals with sensitivity computation based on the auxiliary circuits. Three procedures, for the sensitivity analysis using auxiliary circuits: the Bykhovsky Perkins Cruz’s method, the incremental-circuit approach and the adjoint-circuit approach, are presented. Advantages and drawbacks of these procedures are pointed out. Some illustrative examples are exposed. Chapter 10 focuses on symbolic noise analysis in analog circuits. The symbolic noise analysis of linear or linearized analog circuit at the transistor level of abstraction is presented. A brief exposition on the signal path approach into analog circuits working in voltage-mode and current-mode is given. Computation of symbolic noise parameters of analog circuits is detailed. Two examples are introduced to illustrate the potentiality of the approach. Chapter 11 treats symbolic pole/zero analysis. It reviews some recently reported techniques purposely developed to generate approximate symbolic expressions for poles and zeros under given accuracy constraints. Chapter 12 focuses on the automatic nonlinear behavioral model generation using symbolic circuit analysis. It gives an overview of the symbolic/numerical algorithms for extraction of dominant behavior of linear systems, e.g. formulas for poles and zeros as well as algorithms for generating behavioral models from nonlinear differential-algebraic systems of equations. Applications of analysis and modeling of mixed electrical and mechanical systems are also presented. Chapter 13 deals with nonlinear template-free symbolic performance models of design and process variation. It presents a method for generating performance models which need no prior specification of an equation template, and that handle strongly nonlinear circuits, statistical process variations, and a variety of analysis types. 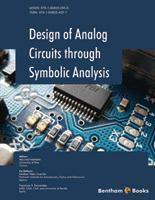 Chapter 14 is concerned with symbolic analysis techniques for analog circuit fault diagnosis and automatic design. It presents a symbolic approach to the design centering problem, and details testability and fault diagnosis of analog integrated circuits. In addition, it highlights modeling of power electronic devices based on symbolic techniques. Chapter 15 presents a brief description of CMOS ring VCOs, where particular emphasis for differential delay cell ring VCOs is given. Then, symbolic characterizations of the VCOs are detailed. The proposed approach relies on the resolution of the differential equations modeling each VCO delay cell. A working example for the case for a symmetric load ring VCO is presented, and obtained results are compared against those obtained with numerical simulation. Chapter 16 describes the use of symbolic methods applied to the automatic exploration and characterization of analog and mixed-signal systems topologies and architectures. Synthesis techniques based on algorithm-level, using an HDL description, and employing, both, a modified signal flow-graph approach and a pattern recognition technique are presented. Chapter 17 deals with application of symbolic circuit analysis for failure detection and optimization of industrial integrated circuits. It demonstrates how symbolic analysis and approximation allows analyzing industrial analog building blocks systems which were considered to be symbolically unsolvable before. Besides circuit failure analysis and modeling, a novel methodology that provides a new application-specific compensation for achieving highest performance requirements, is given. The methodology is demonstrated on several industrial examples.